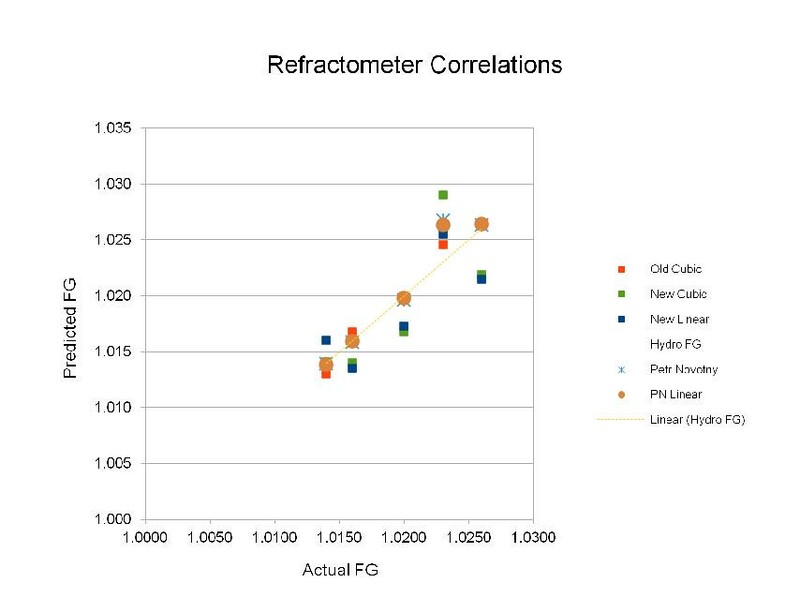 There are MANY on-line brewing tools and calculators but only one (as far as I know) implements improved method of Refractometer Correction Reading calculation. 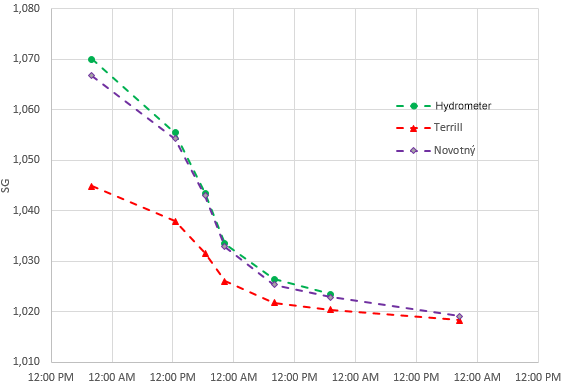 Results (Hydrometer readings vs Sean Terrill correction vs Petr Novotný correction) can be seen on attached graph. As you can see Improved Formula returns correct values even for fermenting (not only fully fermented) wort. Interesting... I signed up (you need to sign up to use the tool) because I noticed discrepancies between refract vs. hydro on my last batch using Sean's calculator, but I'll need quite a bit more data on subsequent batches to determine which tool I prefer. Thanks for sharing! One thing the Czech tool does not do is calculate specific gravity, not at all. To do that, I still end up going back and forth to Sean's calculator. If that could be added, it would be a more useful tool. Is it better now? Or did you mean something else? I can't read Czech, how many beers has this been testing with? My experience with refract is that it gets thrown off by some oils as well as ongoing fermentation, grist with high % of oats for example, or highly hopped beers, will cause the refract to deviate more from the hydrometer readings. 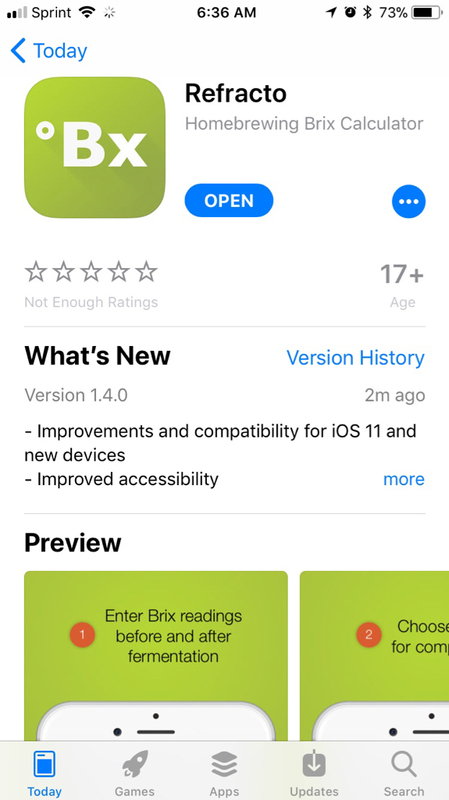 I hate to be captain obvious but why wouldn't you just change the correction factor? Why does their need to be a whole new calculator? Do you have the source code or the calculations? I refuse to think that much about math on a Saturday morning and quite frankly you are an awful person for trying to make me do it. How does this compare to the "traditional" refractometer calculator that promash, and other software, used to have for calculating the gravity of fermenting wort? The reason Sean came up with the new formula specifically for final gravity, using empirical data, was because that old equation often underestimated FG. It's probably because his equation wrong, "grafted" to the experimental data. He used merely data for "well-fermented beer", and thus had little and poorly stratified data, which culminated poorly designed coefficients. No, it's because in the data set I was working with (89 data points from eight breweries - two of them "professional", since that apparently carries some weight), it wasn't possible to generate a mathematically rigorous curve that fit both fermenting wort and gave hydrometer-level precision (±0.05°P) for FG. @a10t2 Who are you quoting there? I don't see that reply anywhere. Wort correction factors vary for every beer, so unless you're measuing the OG with both a refractometer and a hydrometer at reference temperature then you're unlikely to get an accurate WCF. If you are, doesn't that sort of defeat the purpose of it? FYI: you can read a little bit about this "new" approach in latest Zymurgy issue (July/August 2017), article "Revisiting the Refractometer by Petr Novotny". My own data to date has confirmed the Novotny formula for calculating SG from Brix is a good one. Not necessarily "better" than Terrill's, but a bit different, and valid in its own right. Actually, it's the one that Terrill refers to as the "Old Cubic", for which I forget the source but so far it seems closest on the average. Not perfect either, but close on the average. To be fair, some of my data is for very high gravity beers, for which no formulae are very accurate -- they are all calculating FG values 0.003-0.006 higher than my hydrometer. For example there is one beer where my OG was 1.098 as measured by hydrometer (and original Brix was 23.2). Calculated FG for final Brix 12.9 and correction factor 0.99 (yes, NOT 1.04) was anywhere 1.026-1.029 depending on the formula, but my hydrometer said 1.023. So, not a big deal -- next time I make a huge beer of OG >1.090, I'll expect to have to subtract a few points from the calculated FG if I skip the hydro and just use refract. Close enough. For me, ultimate near-exclusive use of refractometer is desirable, as I am a small batch brewer and would prefer to get 14-15 bottles out of a batch rather than just a 12-pack from too many hydro samples. For those doing 5 or 10 gallons, sure, I get why you might not care. But I do. I use this application in my iPhone and have checked it against my hydrometer and it was dead on. Keep in mind I use a digital refractometer. Are you using primelab or terril? I recently broke out my refractometer to check my double mash beer. I think I'm going to be using it more in the mash because I'm going to start trying 45 min or maybe even shorter mashes. But it got me thinking, can I use it for determining FG. I don't care so much about determining exact FG, so much as Terminal Gravity.